New analysis from the RBNZ allows us to see how our banking system works and where their lending activity is focused. Banks are only as stable as their loan books, and although we can't get a look directly in those, the RBNZ does demand a level of transparency from these huge institutions and it shares some of that in their public releases, in aggregate. The 'top level' of lending is revealed in their new S31 monthly release. Banks have loaned a total of $409.8 bln to their customers as at the end of February. 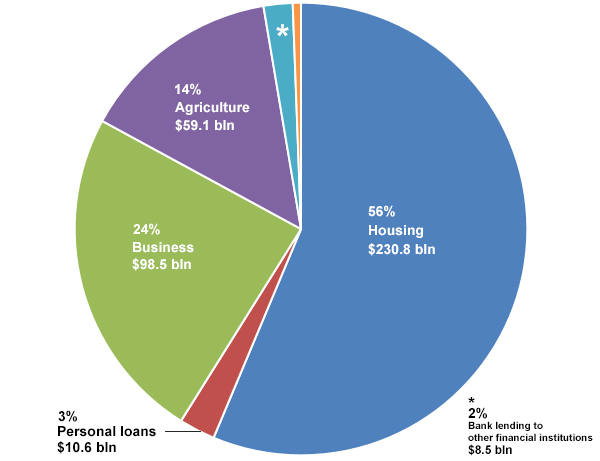 And that shows more than half of all lending is for housing. It dominates bank lending. The new S31 release also reveals the split between loans to owner-occupiers, and separately for residential property investment. The above pie chart is for data as at February 2017, but we don't have data for individual banks as at that date. But we do for December 2016 which allows us to drill into which banks are holding these loans. Of the main retail banks, only BNZ has a 'real bank' spread of loans between sectors. All the other majors are essentially mortgage banks with excessive exposure to the housing markets. It wasn't always this way. Banks have shifted from having balanced lending books to the current distortion in two phases. (Data from RBNZ G3.) The first shift started in the early 1990s when mortgage lending moved from about a third of bank loan looks to about a half. The second shift started about 2004 and took it up another five percent. Over the 27 year period 1990 to 2016, mortgage lending grew by more than 14 times. In the same period, lending to businesses (including agriculture) grew by a little more than five and a half times in current dollar terms. In real terms it will have been much less. You can't help wondering what our economy would look like today if banks had prioritised and supported the productive economy in the way they have the housing markets. Thank you David for this very illuminating data. It shows very clearly the quantifiable effects of the 'housing monster' that I referred to in a comment the other day. It also shows the exposure (via the OBR process) of my bank cash to any downturn and mortgage failure cascade that might affect the housing market. Kiwibank is particularly concerning with its extremely high proportion of mortgage lending, as well as having a lower credit rating (A/A1/AA), a notch lower than the Big 4, if I remember correctly. That's an argument for holding one's cash across multiple institutions. Yup, diversification of savings is key seeing as we have no deposit protection in NZ and the supposed ringfencing of NZ funds in NZ-located Aussie banks isn't comforting and there's no guarantee it will happen. Its actually worse than no deposit protection: the national govt's decision to allow the issuance of covered bonds, whips away all the best mortgages, so our term deposits rely upon only the riskiest of the mortgages. By "covered" I assume you mean "secured?" Why would we rely on the riskiest of the mortgages? Aren't they weighted the same, or do riskier ones get backed by deposits whereas more secure ones get backed by secured bonds? The covered bonds for overseas lenders are guaranteed by a separate pool of residential mortgages which managed to always be performing - i.e. non-performing mortgages are cycled back to the domestic lenders to the bank (aka NZ depositors). http://www.rbnz.govt.nz/regulation-and-supervision/banks/policy/covered-... gives some background. Unfortunately this results in a prescribed good bank (covered bond holders) versus a bad bank (domestic NZ depositors) should the bank get into financial difficulty. 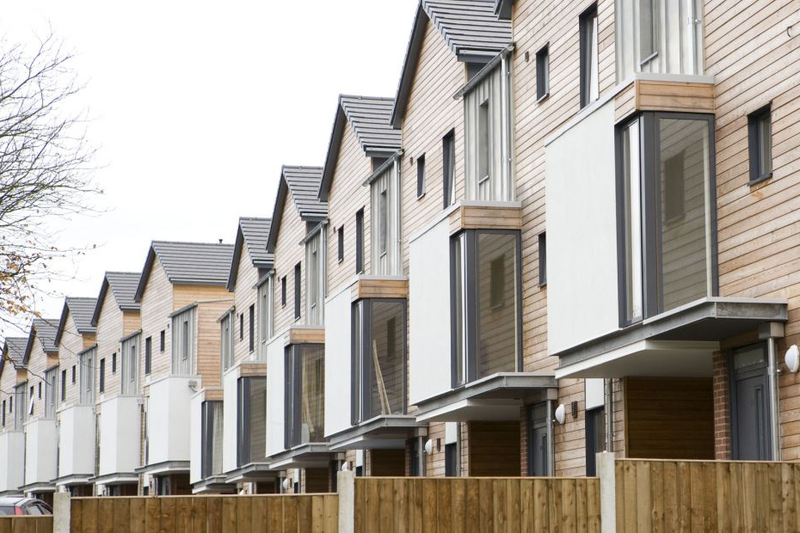 The covered residential mortgages would not be available for NZ depositors in an OBR situation. All the risk is borne by NZ depositors. No risk is borne by the overseas covered bond holders. Sadly most folks will only come to understand it, when/if an event happens. "where does this leave mum and dad investors"...... the answer is simple. In Australia the mum and dad investors are protected by bank deposit guarantees of $250,000 per person per bank (across about 100 financial institutions so you can spread your risk and savings with a little paper work). In New Zealand the RBNZ has set the NZ depositors up to take all the risk of financial instability in any of the banking system. Indeed, OBR is likely to exacerbate any instability insuring a run against the banks should one become publicly known to be vulnerable. There's a useful diagram of the possible OBR process in an article on here from several years ago (https://www.interest.co.nz/bonds/64411/if-bank-failed-and-open-bank-reso...). Bonus Bonds. When OBR came in I asked the RBNZ whether savings/deposits in Bonus Bonds would be subject to a hair cut. The answer I got back was a sort of yes, by implication but sufficiently vague and inconclusive enough for me to think the answer was likely 'probably not' but they didn't want to say that, lest there was a local stampede into BB :-). That was years ago however and the BB Trust Deed may have changed since to bring them into the net. Someone should ask the question again. Basically NZ economy is totally supported by housing bubble. Either support this ponzi or we go bust. I think there is a growing realization that the economy will be toast without housing price growth. The chatter across the Tasman has become a cacophony and you see little clarity on any way out of the situation. Many people are increasingly aware of drivers as to why it is happened and are now concerned about the real implications. In the case of NZ, I very much doubt a change of govt is going to make any difference. What is more interesting is what impacts of various magnitudes (flat, increasing at the rate if inflation, -10%) will be. Subjectively, I would be surprised if things will be "uneventful." Lending to small businesses usually requires housing as collateral (at least it does in Australia so I would imagine bank policy is similar). Given the state of property price escalation, you can see that the monster is likely to be feeding off itself. Yeah I agree with donbond, the Auckland housing market fuels NZ economy. If we go bust it's going to hurt us... Our government should be aware of this. Correct but nothing moves in one direction only so it shows that whenever market corrects it will be worst for ecenomy like NZ that depends solely on housing bubble. Great article and the reader comments give good insight into how the Aussies are thinking. We are a bunch if whingers. Banks will come out and do what they do best. Why are their interest rates lowest in the market. Any prudent lender prices their risk and sets its price for money accordingly and these banks are good at what they do. we did not have any bank collapse in NZ during and after the GFC. Put your money where your mouth is-- Get together, pool your funds and lend largely to non home borrowers. You will get very busy and all these banks that lend to housing will go bust and you might be in business big time. I doubt it. The reason our banks did not have as much trouble during the GFC is because the Australian government stepped up using their balance sheet. The increase in the proportion banks lend against housing was a result of allowing them to lend far more on mortgages than to businesses because less capital was required to back mortgages. This liberal "risk-weighting" of mortgages started in the late 1990s. House prices have been on a tear ever since (apart from a few dips). The various Basel accords have a lot to answer for. Thanks for those links, sharetrader. The banks will of course resist any moves to derail the gravy train. Worth bearing in mind that BNZ's "safe" spread may be due to them being underrepresented in the market for a few years thanks to not using brokers. All continues as the long term trend of inflation and interest rates is downwards which has persisted over the last couple of decades. Banks need a very low unemployment rate to make the servicing aspect work as well of course but stuck in a cycle of low wage growth there is little pressure on businesses right now. That's one of the most baffling aspects to me, we have become obsessive about banking subsequent to the financial crisis but historically most recessions came as a result of other stimuli such as political discourse (e.g. oil crisis) or unsustainable share market rallies. Banks where blindsided by the financial crisis but I wouldn't expect that to happen again in the near future. Any answers David to why the total value of lending is greater than the M3 money supply? I would love to see the two sets of data on the same chart going back 30 years. ie. M3 and credit aggregates are balance sheet items and a balance sheet always...well... balances!